Take a quick virtual tour with Holley Wlodarczyk, Ph.D., UMN Comparative Studies in Discourse and Society, of local community initiatives that install, manage, and encourage native plantings in boulevards and yards, parks and public spaces. 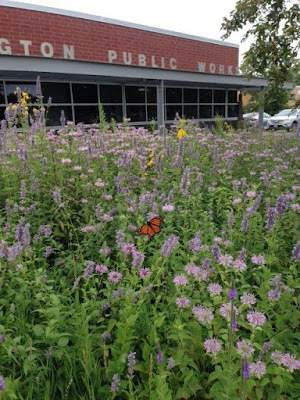 Such projects include extensive prairie plantings around public buildings and along park trails, curb-cut rain gardens dotted throughout suburban neighborhoods, “Bee Friendly” city-wide resolutions—these are just a few of the ways that native plants are being promoted at the community level, demonstrating the beauty and benefits of natural landscaping for private property as well as public land. Following Holley’s presentation is a panel addressing natural landscape funding, strategies, and challenges. It features representatives from local municipalities that work with the metro governments, watershed districts and community organizations involved in these programs. Panelists include Dave Hanson from Bloomington Public Works and Jim Vaughan, St. Louis Park’s Natural Resources Coordinator. Dr. Wlodarczyk is a cultural historian who studies suburban architecture and domestic landscapes; her dissertation is titled Somewhere That’s Green: Visions of Sustainable Suburbia. She is currently writing a book about the visual history of Twin Cities suburbanization. All chapter meetings are free and open to the public. Socializing and setup begins at 6:30 pm. Meet at front door between 5:45 and 6:00 for a walk around Wood Lake.